For one weekend, the international community came together for a world-wide uprising against extractivism, carrying out disruptive actions of civil disobedience against the infrastructure of the climate catastrophe. Together with almost 4.000 activists from all over Germany and Europe I found myself occupying one of the biggest and dirtiest cast mines in Lusatia, Eastern Germany. 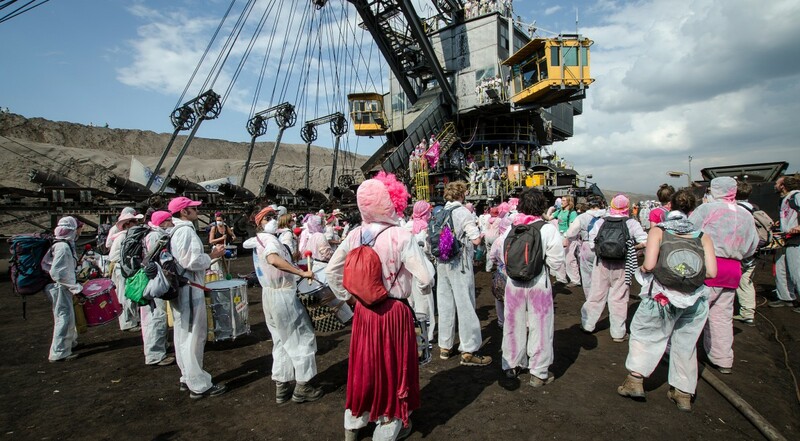 For more than 48 hours we were able to hold our position at several strategic points: activists occupied diggers in the lignite mine, some camped out on the transportation cranes and conveyors blocking the lignite mine, while others blocked further coal mining infrastructure such as the rail way connection to the power plant and the power plant itself. With that critical mass and our peaceful protest we were unstoppable. The police and Vatenfall, the owner of the coal field, could only observe while desperate pepper spray and eviction attempts had little effect. The magic moment: When Vatenfall had to reduce production by about 80% of their coal-fired power plant, fully shutting down one of their towers after running out of coal to burn. A beautiful view, after waking up underneath one of the coal conveyors covered in a thick layer of dust, to finally be able to enjoy the landscape with no poisonous smoke towers disrupting the countryside idyll! German’s coal-fired power plants are among the greatest CO2 producers in Europe. For years the German government has been acknowledging that the only future is with renewables and not fossil fuels. Yet old power stations and the fossil fuel industry are being subsidised with hundreds of billions of euros, allowing them to even expand further. Instead of finally closing down opencast pits and coal power stations, Vattenfall is currently looking for buyers in the German lignite coal branch. This weekend we showed that people have a powerful say in it, because we are the investment risk! While we understand that the financial existence of several thousand families is currently connected to the coal mining industry, this does not justify the harm it is causing to our planet, not just because of CO2 emissions but also because of the poisonous coal dust in the air causing irreversible lung damage kilometres away from the actual mine and other factors. Therefore, we need to phase-out coal in a socially and ecologically responsible manner. We need system change not climate change. Let’s break free from fossil fuels and keep them in the ground. Climate Justice is in our hands. Challenging not just coal, hydro-fracking or oil, we fundamentally speak up against the logic of profit and the madness of growth. Even if our actions are not legal – they are by all means legitimate. Ende Gelände 2016 was by far one of the largest-scale movements of civil disobedience the climate movement has yet seen, creating quite some noise not only in local politics and newspapers but on an international scale. I personally enjoyed the great networking opportunity, the inspirational and festive atmosphere and thought-provoking discussions a lot.